Members took the unusual step of meeting on a Saturday. MEMBERS OF THE Banking Inquiry took the unusual step of gathering for a Saturday meeting this morning, in a bid to avert a crisis that threatened to collapse the work of the panel. But after a five hour session – described as ‘tense’ at times – it was agreed the work of the committee will continue. Members signed off on a plan for a ‘finalisation team’ to bring the panel’s report over the line within the next two months, ahead of a mid-January deadline. “This is essentially the committee taking back control of the process,” one member told TheJournal.ie this evening. Members of the committee - which is made up of 11 TDs and senators from across the political spectrum – got their first view of the Inquiry’s draft report during the week, prepared by its staff. However, reports soon emerged that members were concerned it was weak, and ‘lacking coherency’ in parts. The TDs and senators tabled hundreds of amendments to the draft report, giving their suggestions of changes. 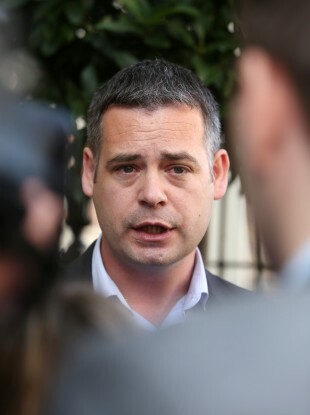 “We always knew there would be amendments and the members’ input would change the draft form to the final and substantive and final report,” Sinn Féin’s Pearse Doherty said this morning, on his way into the meeting. “The question is – does the process we have laid out and does the time-frame we have laid out allow us to do that? A statement was issued shortly after 4pm, indicating the current crisis had been averted. It explained that “some of the material matters that members want to deal with in terms of the report are not suited to the amendment process”. The ‘finalisation team’ being put in place will be made up of two members of the committee, two parliamentary assistants, a legal expert, and two members of the Inquiry’s back-up staff. The other nine members of the committee will feed their suggestions for changes to the draft report through that team, in the hope of being able to sign off on the next draft before the end of the month. The TDs and senators have agreed to send their proposals by tomorrow – and the finalisation team will meet with the other members for an update on Tuesday before continuing with its work. The two members heading up that team – TD Eoghan Murphy of Fine Gael and Senator Susan O’Keeffe of Labour – were continuing work in Dublin this evening, following the break-up of the full closed-doors session. On the road to Dublin for a very important meeting of the Oireachtas Banking Inquiry. Fianna Fáil’s Michael McGrath said this evening he was hopeful members would still be in a position to agree a final report. “That said, difficult days lie ahead,” he said. He said members of the Inquiry and taxpayers had invested too much not to complete the process. The final report, it’s hoped, will shed new light on the crisis and make a series of recommendations to prevent such a crisis occurring again, McGrath said. The Banking Inquiry committee is chaired by Labour’s Ciarán Lynch. Its membership includes Fine Gael TDs John Paul-Phelan and Kieran O’Donnell, as well as Murphy. Representing the opposition are Fianna Fáil’s McGrath, Sinn Féin’s Doherty, and Socialist Joe Higgins. In addition to Susan O’Keeffe, the committee also includes senators Micheal Darcy (Fine Gael), Seán Barrett (independent) and Marc MacSharry (Fianna Fáil). The panel concluded public hearings in early September, having heard from 128 witnesses over 49 days’ of sittings. This included hearing evidence from former taoisigh Bertie Ahern and Brian Cowen – as well as several former and current senior bankers during hours of public sessions. On top of this, the committee sat for hours and hours of private meetings deep in the bowels of Leinster House. It was initially envisaged that the report of the panel would be finalised towards the end of this month, to be published on 20 January. Read: How many of these TDs can hold their seats? Email “Crisis averted? Here's what was agreed at today's 'tense' Banking Inquiry meeting”. Feedback on “Crisis averted? Here's what was agreed at today's 'tense' Banking Inquiry meeting”.